Regarding the right hand the mordent is placed on b, so I play the c and then the mordent. 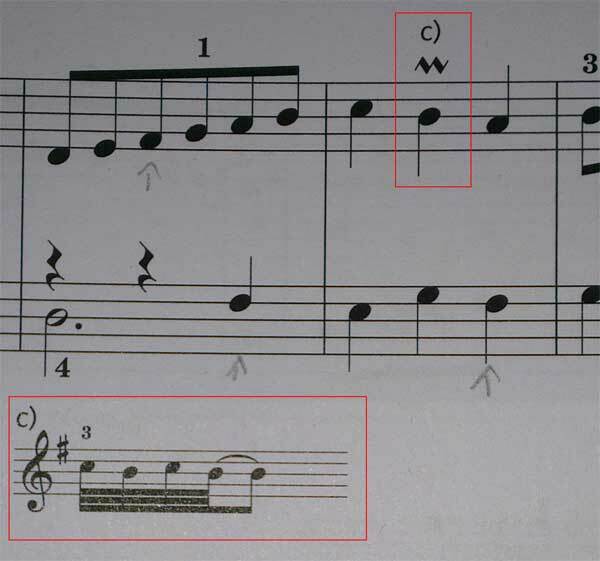 The mordent is explaint at the bottom of the book but beside the fact that it is awkward to play (first note of given bar is a c and the first "mordent" is also a c) it also looks wrong. When I look the mordent up on wiki http://en.wikipedia.org/wiki/Mordent I see the upper mordent here. Both the upper and lower mordent are however played with the original note first. In my case it would be h-c-h, which flows much better. Now the gotcha is that the menuett was written somewhere in the lifetime of Petzold :), between 1677-1733 which was in the Baroque period. The same article above says that in this time a mordent was a lower mordent instead of an upper mordent. So I would play the h as h-a-h. I'm fine with both however as I am a novice I cannot explain why the editor of the book "helped" me by showing something that rather looks like a trill and in my opinion is a tone higher as expected. As you say, a Baroque mordent is played H-A-H as you have it (for non-Germans among us, that is B-A-B) during the Baroque period. However, that isn't a mordent in your music, it's a short trill. A mordent has a vertical line through the mark, as both of your links show, and also as both of your links show, the trill begins a step up from the main note. It can be played as written in the note c) in your music. Now, you will notice that the trill in your first link begins on the main note. This is typical of music from Beethoven's time onward, with some discussion about what was customary after 1750 or so. (Mordents began using the main-upper auxiliary-main format after 1700 or so, called sometimes "inverted mordents" for this reason.) In the Baroque period, the trill generally began on the auxiliary note, except when the previous note was the same as the auxiliary (which is the case in your music). Then you would sometimes see performers begin the trill on the main note, because as you say it flows better by avoiding a repeated note. You can leave out the first C in the trill if you like. Personally, I like to leave it in when I want to add a bit of an edge to the trill. Not the answer you're looking for? Browse other questions tagged theory piano notation articulation or ask your own question. Is this piece supposed to be played by one person? How to indicate 'pianist fill in rest of the chord' given highest note and chord? How do I play this mordent?